Boulder City High School girls basketball jumped out to a 8-0 lead Monday, Jan. 8, against Pahrump Valley, but weren’t able to hang on in a crushing 26-24 defeat. Horace Langford Jr./Pahrump Valley Times Boulder City High School sophomore Keely Alexander attempts to stop Jaquellen Stobbe of Pahrump Valley during Monday's crushing 26-24 loss. 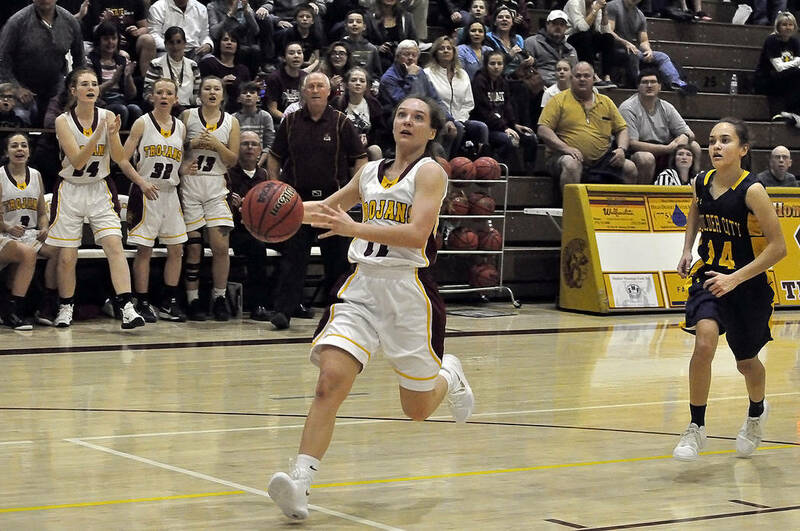 Holding the Trojans scoreless in the first and second quarters, Pahrump Valley used an 11-1 second-quarter run to get back into the game, before a dramatic 15-12 in the fourth quarter sealed the victory. Misfiring on several shots from the field, the Lady Eagles let Monday’s contest slip away at the free-throw line, connecting on only 6-of-13 attempts. Struggling offensively as a unit, junior forward Hannah Estes had a solid outing with 11 points, while sophomore guards Madison Manns and Keely Alexander each scored 5 points. Sophomore forward Ellie Howard concluded the effort with 3 points. Hoping to get back on track the Lady Eagles will head to Moapa Valley on Friday, before hosting Del Sol on Tuesday. Looking to make a big second-half push, Boulder City High School boys bowling team routed Somerset Academy-Sky Pointe on Monday, Jan. 8, 1,569-969 in their first match back from holiday break. Leading the way for the Eagles at Boulder Bowl, freshman Jamison Kaboli bowled a game-high 577 on the day, breaking a score of 200 (209, 200) in his first two matches. Rounding out the Eagles’ efforts, junior Sam Holt bowled a 370, while sophomores Justin Jolly and Connor Dykstra added scores of 314 and 308, respectively. With Sky Pointe unable to field a girls team, the Lady Eagles had a practice round, highlighted by senior Bailey Bennett-Jordan and sophomore Christine Smith, who bowled 386 and 379, respectively. Senior Camille Torgesen bowled a 357. Hoping to continue to make a push toward the postseason, the Eagles will travel to Wildfire today to face Del Sol, followed by a home match on Wednesday, Jan. 17, against Somerset Academy-Sky Pointe. Tuesday’s flag football against Virgin Valley was canceled because of rain. A make-up date has yet to be announced. Today, Jan. 11, vs. Del Sol at Wildfire, 3 p.m.
Wednesday, Jan. 17, vs. Sky Pointe at Boulder Bowl, 3 p.m.